The art and theatricality of HIV / AIDS activism captured the imagination during the 1980’s first crisis. 30 years later and HIV / AIDS still rages across the world. One of the little-known root causes of the global HIV pandemic is due to homophobic legislation introduced by the British Empire during the height of colonialism. In the 76 countries where it is homosexuality is still illegal, HIV transmissions are still on the rise as the stigma is compounded, further allowing, pharmaceutical companies which profit from the pandemic see our latest event ‘In the name of David Kato’. ‘DecAIDS’ is a theatre show for people living with HIV / HEP to share the realities of life, love and struggle, to celebrate the journey the lives of those living with HIV / AIDS and to highlight root causes of the pandemic. So often, people living with HIV and other conditions, are stigmatised in our society; treated as passive recipients of resources, or silenced and invisibilized altogether. So in typical ACT UP LONDON style, full of cabaret, mischief and flair we aim to create all the materials for a highly creative, potentially disruptive, very meaningful action in august. The creative team exists to frame Decaids in a way for maximum cheekiness / reaction and to connect, agitate and empower diaspora LGBT / HIV groups living in the UK to animate in an accessible and inspiring way the relationship between the HIV pandemic, global homophobia and the role of the British Empire. Decaids is a 2 part process – (1) Subversive royal HIV celebration march towards Buckingham Palace and (2) A Theatre show in a central London location. Draft Promotional Text – DECAIDS – Her Royal HIVness Celebrates Us All. ‘One would be delighted to join one for DECAIDS in August 2016. DECAIDS will be hosted in the divine London Royal Palace Lavatory where aperitif’s of pheasant and poppers will be served. 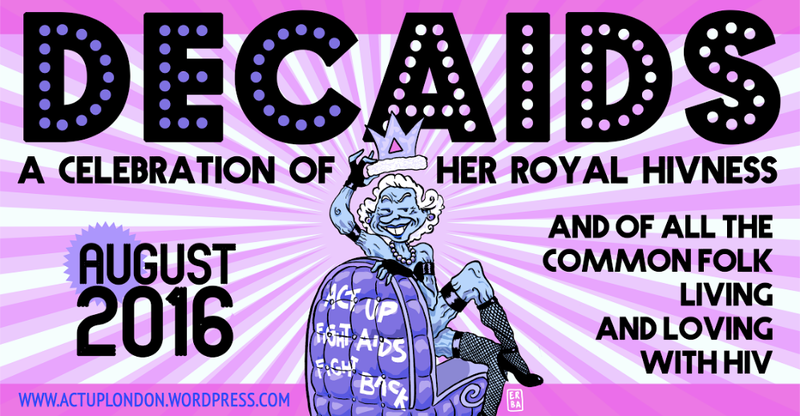 DECAIDS is a celebration of the Royal and the Common Folk living with HIV. It serves to celebrate the 10th anniversary of Her Royal HIVness (me) diagnosis’. Please do join one to celebrate that hot stud ten years ago who royally fucked me without a condom, without whom, I may never have met ordinary fine folk like oneselves. I know that in my time on the throne I have been doing bugger-all to acknowledge the global HIV pandemic that my beloved British Empire got off the ground – but now I have seen that my crown has been too tight. I will share my crown jewels for all as I am ever so pleased to announce that I will add to my royal duties the celebration of those living with HIV. Similarly, just as I write to anyone when they reach their 100th birthday I will write to those ones who have lived with HIV for 1 week, 1 year, 10 years, 20 years or indeed any significant anniversary and then welcome them ones to this royal occasion and celebrate them – one and one all. “I see “Shafted” the show as a stepping stone to breaking down barriers of stigma, and have everyone accepted as one.” Billy, Shafted?! storyteller and performer “On behalf of ACT UP New York’s alumni, we’re thrilled to see the UK acting-up again. Shafted?! reminds us of our gloriously ribald and creative roots, so keep up the fight, comrades. Until there’s a cure, ACT UP!” Peter Staley, legendary AIDS and gay rights activist. We have a range of leading artists, theatre-makers and activists involved in ACT UP LONDON and beyond who will be developing the show. We will also be working with a wide range of London’s leading HIV service providers to develop and produce the show. ACT UP London is a diverse, non-partisan group of individuals united in anger and committed to action to end the HIV pandemic. We are part of the global ACT UP network – see the film trailer ‘United in Anger’. ACT UP London combats this through creative campaigns – we recently led the ‘Beyond UKIP Cabaret’ including ‘HIV anti- stigma’ classes at the front of UKIP leader Nigel Farage’s pub, held a series ‘HIV Blind Date’ events, in which contestants – three people living with HIV and/or Hep C – answered questions relating to their vision for the future and organised ‘AIDStravaganza’ – welcoming in new artists’ work to animate the issues at hand. Cuts to services, rising transmission levels and the mistaken belief that HIV was resolved in the 1980s have led people to name this era – the ‘HIV Second Silence’. All details at www.actuplondon.wordpress.com and @ actuplondonfighttilltheend@gmail.com ACT UP! FIGHT BACK! FIGHT AIDS!